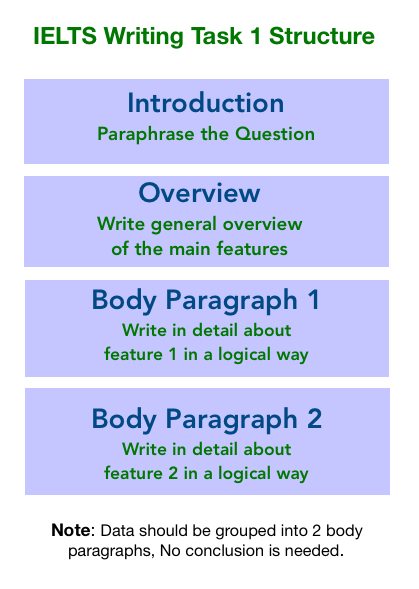 IELTS academic writing task 1 process diagram. Model answer included. You do not have to write about every single feature on the chart or diagram. Pick out the main features and also use the language of comparisons. In the case of a process diagram it is pretty straightforward. Just describe the process using the active and passive and sequencers. Check the grammar needed here in this lesson. In the task below, I used a process diagram from the Cambridge IELTS 12 Academic book. I advise only using official IELTS material when practicing as there is a lot of fake material out there with IELTS. You can get this book online at Amazon. 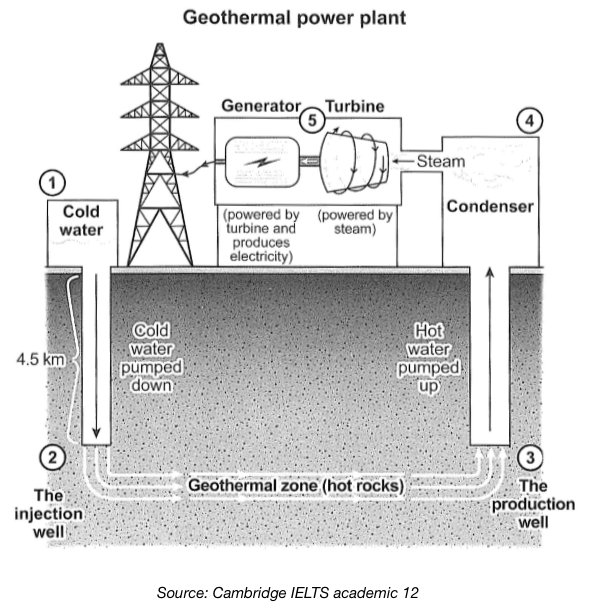 The diagram illustrates the process by which geothermal energy is used in the production of electricity. Overall, there are five steps in the process, starting from pumping down cold water into the geothermal zone, to producing electricity from the generator which is then sent into the electrical grid. In the first step, cold water is pumped down 4.5 km underground through the injection well. Next, the water is injected into the geothermal zone, where hot rocks heat the water up as it passes through the Earth. Once the water has been heated up, it enters the production well and is then pumped up to the ground and into the condenser. The last two stages are carried out above ground at the power plant. First of all, steam is produced from the hot water in the condenser. In the following step, the steam passes into the turbine and makes it spin. Finally, the generator, which is powered by the turbine, produces electricity where it is then transferred into the electric grid via power lines. In the first step, cold water is pumped down 4.5 km underground through the injection well. Next, the water is injected into the geothermal zone, where hot rocks heat the water up as it passes through the Earth. Following this, once the water has been heated up, it enters the production well and is then pumped up to the ground and into the condenser. Main body 1 – I wrote about the process underground. Main body 2 – I wrote about the process above ground.